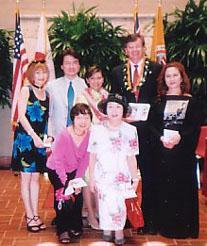 Members of Yasuko Shimizu and Her Fellow Singers are involved in various dinner concerts throughout the year. We have also been performing over４8 charity concerts for "The Fountain of Angels" for １８ years to support the campaign for conquering pediatric cancer. 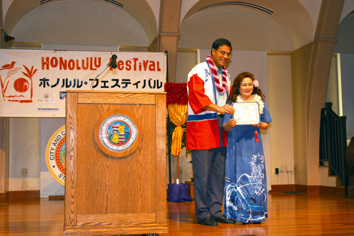 This will be our 15th consecutive time to participate in the Honolulu Festival. We believe that we can reach everyone's heart through music. We continue to take part in promoting US-Japan friendship and cultural exchange. The Charity Concerts held by Yasuko Shimizu in 1996, named “To Love: Angels’ Fountain for overcoming Children’s Cancer”, started in 1996, The charity concerts were held in various places in Japan. This year, the charity concert will be the 20th, the Volume 48. During these events, we often heard of “CliniClown” (Clown in Hospitals) and “Crown Doctors”, and of many children waiting for their visits. In researching the clowns’ activities, we got to know the activity of “RED NOSE DAY” in England, the U.S., Germany, Russia, Australia, etc.). In Japan, too, the “Nose Day” was formally registered, and in August 7 in 2009, the event called “RED NOSE DAY” started to support sending of such clowns wearing red noses, the symbol of a clown, for children’s smile. We, too, have decided to hold this activity for diseased children, as well as the “Angels’ Fountain”. 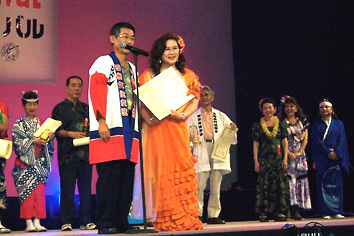 Thus, we have participated in Honolulu Festival 18 times, and received 16 Contribution Prizes. Believing “Songs are understood all over the world”, we will continue the participation in such events for the Japan-US Friendship and Culture Exchange. Singers will be Yasuko Shimizu and Wataru Tsubai, MC will be by Yukari Miyata. 1969年日本航空のキャンペーンソング　An old campaign song of J.A.L. 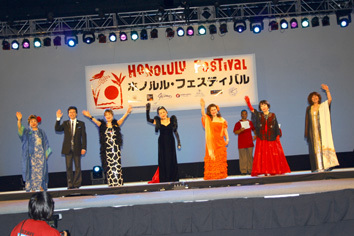 This is our １４th participation in Honolulu　Festival. We have had many wonderful encounters during these １４ years. Every year we enjoy joining the festival of cultural exchange through singing songs. This is my 13th participation in Honolulu Festival, travelling here every time by JAL very comfortably. which used to be sang by my very favorite senior singer Yasuko Ohki. 20th Annual Honolulu Festival march 7-9.201４ for U.S. Transforming the World; Connect! Discover! 清水康子 椿井　亘 前田はるみ"tango" くみあおい"latin"